This Peanut Butter Muffin In A Mug is probably one of the fastest recipes I’ve ever made (although 3-Ingredient Peanut Butter Cheesecake In A Bowl is a close runner up!). It’s possible I love peanut butter. Stir all the ingredients together with a fork inside a mug, nuke it for a minute, and you’ve got yourself a perfectly moist, peanut butter-y cake that’s ideal for enjoying all by itself, with a handful of fresh raspberries and whipped cream, or with a sprinkle of sugar-free chocolate chips! I recommend using either Lily’s, Trim Healthy Mama chocolate chips, or chopping up part of an 85% Lindt chocolate bar. The cool thing about this warm Peanut Butter Muffin In A Mug is that it contains far less calories by using defatted peanut flour instead of actual peanut butter! So, while this MIM is still an S, it’s not nearly as calorie-dense as it could be, and yet there’s no skimping on flavor or protein. 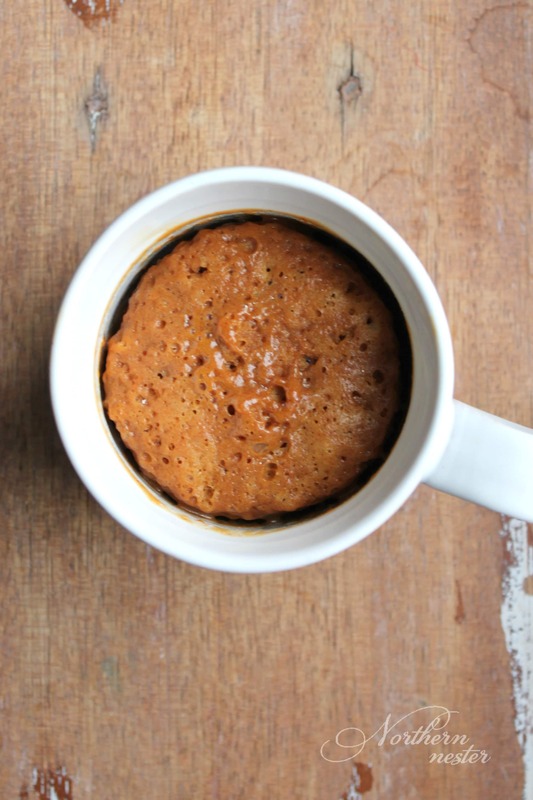 Let me know if you try this Peanut Butter Muffin In A Mug and how ya like it! You can even make it dairy-free by using coconut oil instead of butter! This deliciously tender Peanut Butter Muffin In A Mug take less than 2 minutes to make and is full of healthy fats and protein! A great THM S, gluten-free, sugar-free, low carb and keto-friendly breakfast or snack. Stir all ingredients together in a mug and microwave for 1 minute. Enjoy immediately! Dress up this muffin with some sugar-free chocolate chips, or fresh raspberries for a PB & J flavor! Could I use THM baking mix instead of the peanut flour? Would using egg whites instead of the whole egg change the flavour much? Then would it be an E or FP with the peanut flour & egg whites? This was wonderful. Thanks for sharing. I am on my way to the kitchen to make it again now. Any way to make this in a conventional oven? I refuse to use a microwave. Mmm. I’m eating this right now. I love the texture. It’s more bread-like than other MIM recipes I’ve tried. I used 1 1/2 tsp pyure for the sweetener, since that’s what I have. This is so good and satisfying! I even replaced one of the TB off peanut flour with a TB of cocoa and it is to die for!!! Thanks for the recipe! This is truly delicious. I increased the butter to 1 T the second time I made it because I thought the first one was awesome but a tad dry. I doubled the recipe and made two at the same time. I am saving the second for later. I also added the THM chocolate chips as suggested. So good! This is my favorite MIM EVER! I add just a tsp of natural peanut butter and some Lilly’s chocolate chips and I have eaten it for breakfast EVERY day. I can’t believe how full it keeps me more than my traditional sprouted toast I would eat every day. Thank you for your amazing recipes. They are some of my favorites! I’m not a huge pb fan, but this has just the right amount of peanutty flavor! This is definitely going to be one of my ‘go to’ breakfasts. And I’m for sure going to try the cocoa powder suggestion in the comments for my next one. I just made this and it was delicious. I made it with the xylitol and it had a little bit of an after taste. I think I’ll try the gentle blend next time, because there will definitely be another time. Just made this for the second time. Upped butter to 1 TBS due to dryness and did 1 TBS of cocoa powder. Yum? Can I add some cream next time? Still a tad dry. Or if I do raspberries, how many to keep it an S? Thanks for the wonderful recipe!